Countdown to Christmas Day 2: Scents of the season with One Fur All! We're counting down to Christmas! Every Tuesday and Thursday we're unwrapping a new giveaway for dogs and the humans who love them! On Tuesday we unwrapped the "Beagles Go Around the World" coloring book! And today, we have another great gift for dog lovers! 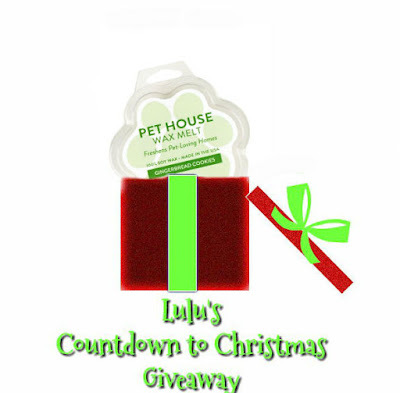 DISCLOSURE: All prizes and review samples in Lulu's Countdown to Christmas Giveaway were provided for free, but no other compensation was provided. All opinions are my own. We're excited to announce our new campaign! EDITOR'S NOTE: This is an updated version of the original Off-Beat Holiday Gift Guide. I bought the bed for the cat on Black Friday at Petco. Lulu doesn't even fit in it, but she loves it! I tend to like different things though. I look for the unusual and fun for myself, and I want the same for my pets whenever I can. 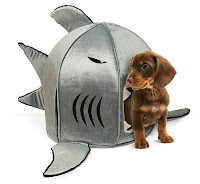 So without much ado, here's some of the fun pet items I found that would make great gifts for the holidays. A shark pet bed! We first saw these on Think Geek, but they don't sell it anymore. But you can find a whole bunch of different ones on Amazon. This "Nightmare Before Christmas" themed dog bed is horrifically awesome. 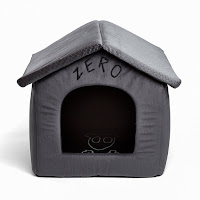 It comes in two sizes and is easy to clean with a removable insert, perfect for the Zero in your life. Got a dog who likes to stick its head out the window of a moving car? Or do you take your dog for rides on bikes, even motorcycles? 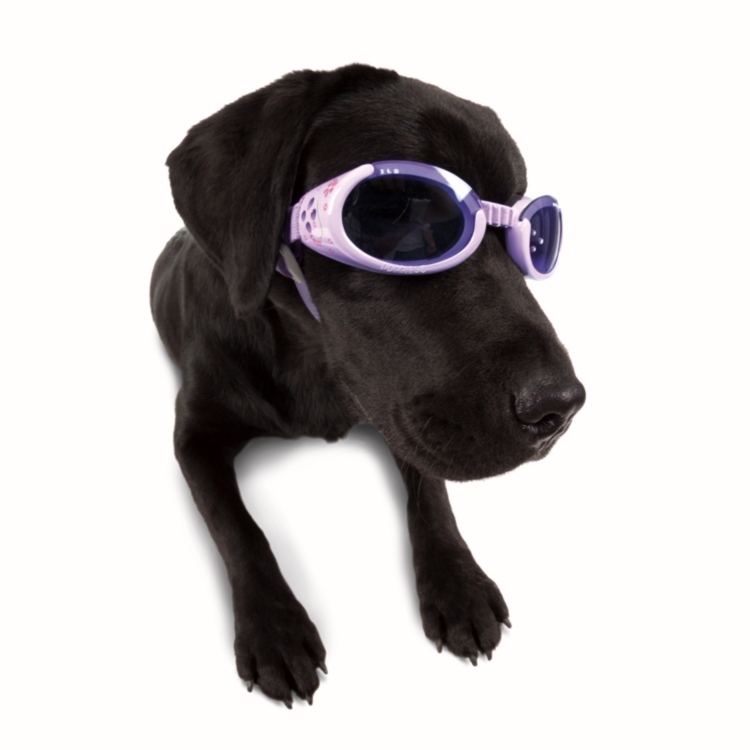 The doggles allow the dog to ride without getting things flung into their eyes. Here's a cool toy, and it gets the dogs thinking. 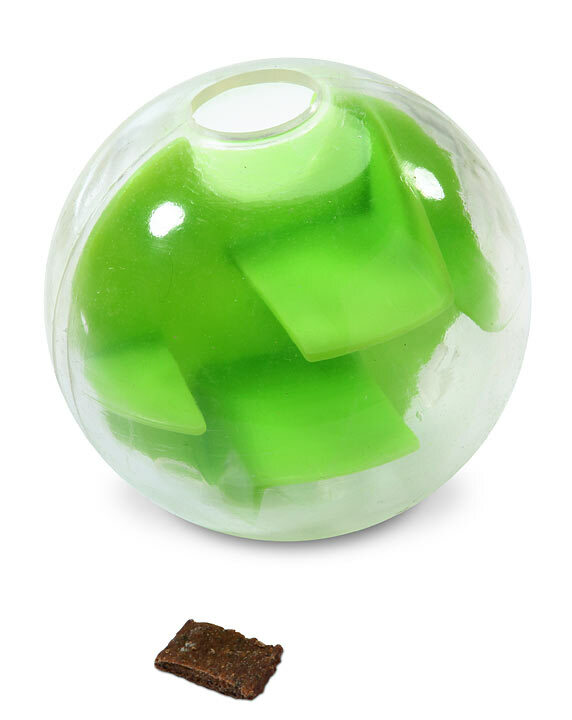 It's called the Orbee-Tuff Mazee Treat Ball, by Planet Dog. The dog has to negotiate the treats through the maze and out of the ball. More treat puzzle toys, but this one is really cool. It's called Trixie Gambling Tower. You put the pieces in various spots, and the dogs have to figure out how to get it out of the tower. 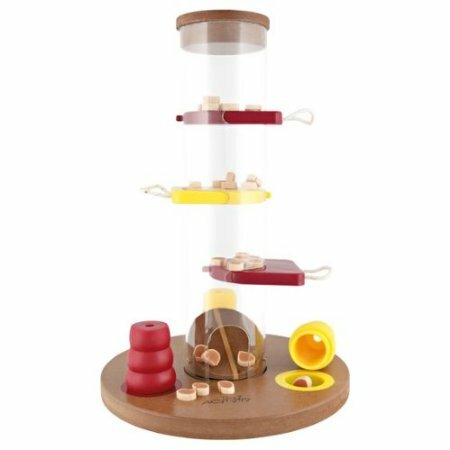 Trixie has other puzzle toys, including a roulette wheel, a mad scientist game, and a chess set. This is available at Amazon.com. We live in Florida. Sure it's cool right now, but this will be over soon. Probably by Christmas. 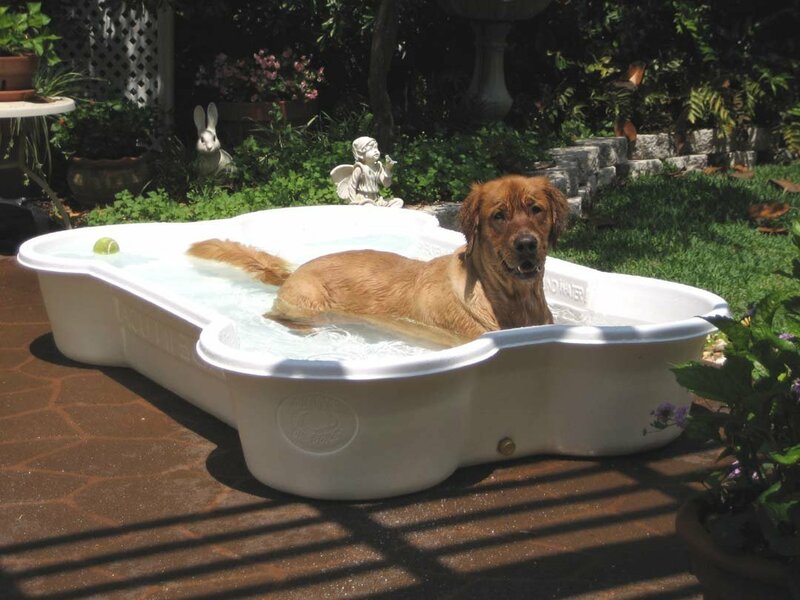 Give your dog a great way to cool off from running around all day. This Bone-shaped doggy pool is like a kitty pool. The company that makes them, One Dog One Bone, also makes a paw print-shaped pool. You can find these pools at Amazon.com. 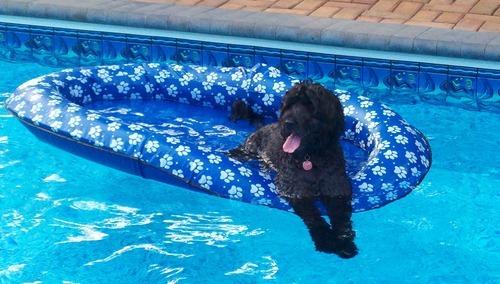 Of course, if you live in one of those houses where the backyard is all pool, and you don't mind your puppy in the pool, get them their own lounge. You can find this at Amazon.com. 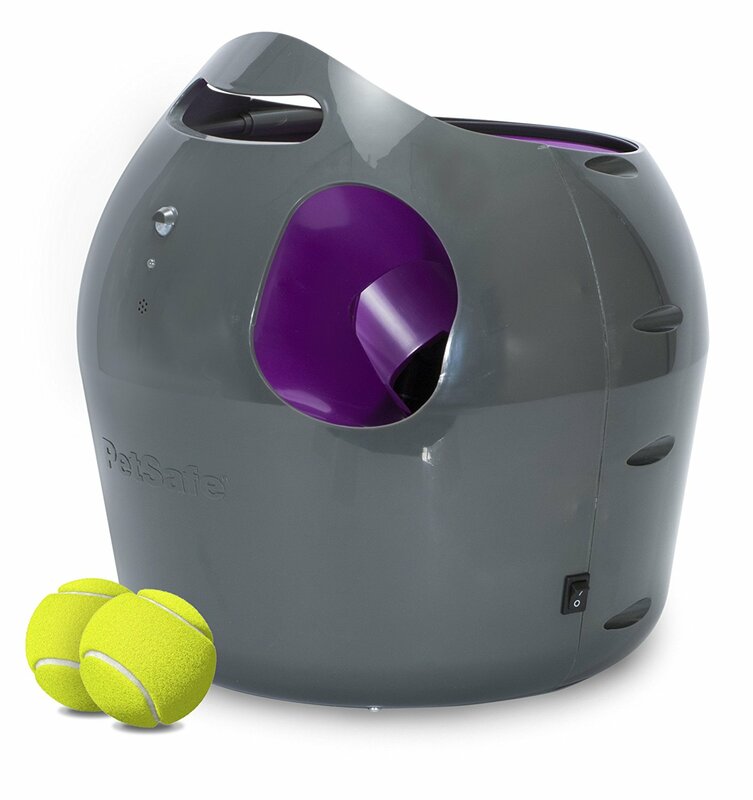 PetSafe, purveyor of fine electronic pet products, makes it easy for you to keep your dog busy whenever they want to be. The Automatic Ball Launcher can launch balls up to 7 feet, and comes with 9 settings. You may scream for ice cream, but your dog is howling for it. 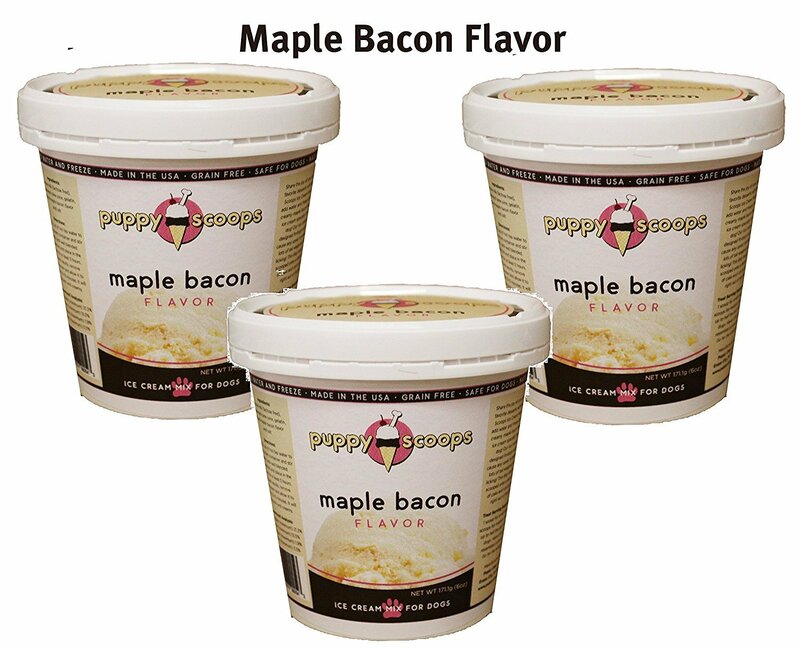 Puppy Scoops is an ice cream mix for dogs, in flavors dog like -- like maple bacon. 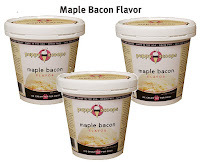 It's a lactose free ice cream that's low in fat. All you do is add water to the powdered mix, then freeze it. How does a dog handle living in a house during the holidays? Most people can't handle all the amazing smells and things. That's why we all gorge ourselves. Dogs, meanwhile, have more olfactory cells than humans, and beagles moreso. No wonder they beg for food, and not everyone has trained themselves to resist those big sad eyes when they start begging. There's lots of things dogs shouldn't eat during a holiday. HOWEVER, there are some things that you can give your pet so they can enjoy the holiday too. 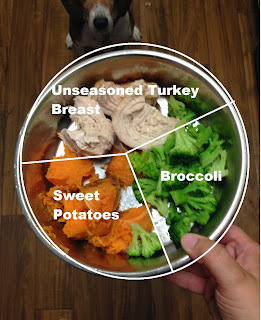 Presenting the doggy Thanksgiving dinner. We celebrate freedom in America, but as we always say -- freedom isn't free. The problem is, the people who pay that price for us often pay more than we can possibly imagine. Even if they are not hurt in body, many are wounded in mind and spirit. At least 20 veterans commit suicide every day, according to estimates by the Veterans Administration. 1 in 5 veterans suffer from post-traumatic stress. A wonderful organization in Florida is saving not only the lives of veterans, but the lives of rescue dogs as well. K9s for Warriors accomplishes this mission through the help of donors and volunteers and at a facility that's not unlike a homey camp. And I got to tour it in July 2017, one day before a new class of veterans arrived. 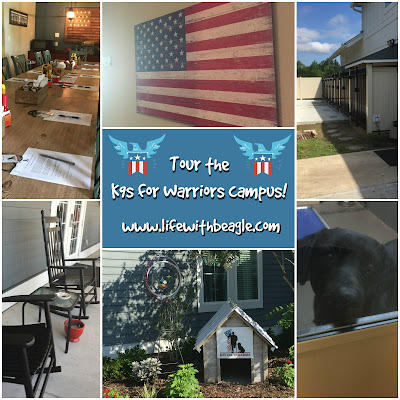 DISCLOSURE: Merrick Pet Care helped set up this tour of the K9s for Warriors campus. They are a proud sponsor of K9s for Warriors. I did not receive any monetary compensation for the post, and all my opinions are my own.